MANTA RAYMANTA RAY FACTS AND INFORMATIONMYLIOBATIDAE FAMILYManta Ray Facts and Information. Feeding, habitat, distribution, reproduction, anatomy and more. Facts about Giant Manta Ray and Reef Manta Ray. INTRODUCTION TO MANTA RAYSYou may hear the manta ray referred to by many different names. They include devilfish and manta. However, they are all the same. The name for these aquatic creatures stems from the word manta. In Spanish that means cloak or blanket, and the name is the result of a type of trap that was once used to capture them. Conservation Status VulnerableIt is hard to confuse the manta ray with anything else in the waters due to the unique body design that they feature. They have a round body, wings on the sides, and outward lobes from the front of a very large mouth. They also have lots of teeth on the lower jaw area; it can have up to 18 rows there. They don’t have any teeth in the upper jaw. They can weigh as much as 2,900 pounds and be up to 23 feet wide. The overall size depends on the species and also on their location. They are dark colored, including shades of black, blue, gray, and brown. They also have individualized markings and designs that allow them to be identified by experts. This unique pattern is a great way to find a particular manta ray that they are researching. The manta ray has a vast range of locations where they can survive. Some of them live in the ocean in the deeper waters so that they can be warm. They do need to move to the cost regularly though for cleaning stations. Others live in the subtropical and tropical regions that offer them warmer waters close to the shore in the coral reefs. They are migrational and will travel any distance that they need to in order to find food and shelter. They also have to migrate due to the temperature of the water during certain times of the year. While the manta ray is usually going to live an isolated existence, during certain migration times of the year they are found in locations in large numbers. One of the prime locations where you can see lots of them is the Western coast of Australia. They seem to be able to hide quite well from predators at the bottom of the water in the sediment. They have a flat body that is flexible as it consists of cartilage rather than bone. They live most of their life isolated and migrating. They do spend time together for mating purposes and then go their separate ways again. Most of the feeding takes place at night for the manta ray. Plankton make up most of their diet but they are quite opportunistic. They will eat what they must in order to survive. They continue to move around to find food. Sometimes, it can be a short distance and other times they are traveling huge distances in order to find enough food for survival. They are isolated most of their life, taking very little interest in each other except for mating. The males will chase a female for a period of time in the water, and she will decide who she wants to mate with. After mating, it takes her about a year for the young pup to be born. Mature females will give birth usually every two years. 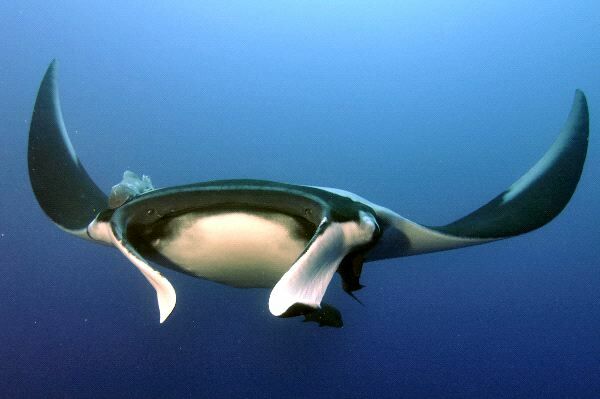 Mating is determined by the size of the disc overall, not the age of the manta ray. The males need a size of around 13 feet and the females need a size of about 16 ½ feet before they are ready to mate. It is believed that the full moon plays a huge role in what triggers mating rituals.